My Gentle Readers, Alice has given us a gripping page turner that I had a lot of trouble putting down to deal with real life. It’s Paris, 1888, and someone is committing heinous murders by turning artist models into sculptures of mythological figures. The police are baffled, but occult bookstore owner Rémy Sauvage thinks he sees a pattern. Driven by revenge for one of the victims, Remy eventually joins forces with Claude Fournel, a second generation artist, and his mental hospital patient turned muse, Margaret Finnegan. The trio tries to stop the murders and clear the suspicion that has fallen on them directly. As Paris prepares to reinvent itself in the world’s mind, they can scarcely bear a black eye such as this. 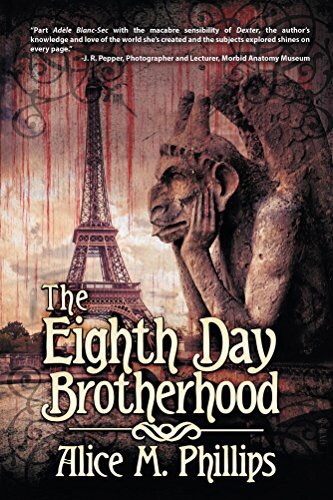 Murder, love, history, and a touch of the occult, “The Eighth Day Brotherhood” is a page turner you won’t be able to put down. Grab you copy on Amazon Here. You can find Alice on Facebook Here. Today my Gentle Readers, I have a new author for you to meet. His name is William Fietzer and he has three titles available on Amazon exploring such topics as crime and technology, with his latest adding in paranormal and the concept of a collective unconsciousness. As usual, my comments/questions will be in BLUE and we will have William’s responses in GREEN. William, thank you for stopping by to talk to us and share a little about yourself and your work. You have some diversity in your portfolio already. What got you started in the literary world? Gosh, I think it goes back years ago to my babysitter (a elementary ed teacher) who read to her own slightly older children (before the age of day care) and I wanted in. After that, my parents, grade-school teachers, and librarians encouraged me to read and I had them read (and later on read myself) all of Aesop’s fables and Black Beauty (wotta tear-jerker) to me. After I discovered Walter Farley‘s books and devoured all of them in print, I began to write my first novel, “Black Phantom,” a story that never got beyond the cover design though I still promise myself to fill the covers with a manuscript. After that I read anything that came my way and decided to become an English major in college. But it was really during my stint in the army that I completed reading all the popular writers like Norman Mailer, James Baldwin, and Ken Kesey along with “disreputable” ones like D. H. Lawrence, Henry Miller, and William Burroughs to complete my literary education. Since then, I’ve come to consider Marcel Proust (for his style and breadth of thought), Graham Greene (for the variety of his characters and settings), and Colin Wilson (for his concept of the outsider and his investigations of the paranormal) as role models. Oh, and Raymond Chandler just because. Bit of a whirlwind tour of great authors there. I’ll have to link them up for my readers to follow along with your journey if they choose. Do you find yourself gravitating towards a particular genre these days? I don’t consider myself a genre reader. I just read what interests me at the moment. That may be anything from metaphysical fiction to forensic anthropology. My reading may not be as broad as it was earlier in my life, but I read much more deeply and intensely. All this reading seems to have inspired you, as you started a novel early in your life. What truly pushed you over that line from just reading great stories, to wanting to put your own into the world? I mentioned before my first (unsuccessful) attempt at writing a novel. Though I aspired to become a writer during my undergraduate days, it took me years to shake off the inhibitions incurred as a graduate student of English before I gained enough confidence to write and complete a work of fiction. I edited and wrote for several pre-professional library publications during this period, but it was only after I submitted (one minute before the deadline) a teleplay to a local PBS station contest that I gained the confidence to complete a full-length fiction manuscript. And then it was another fifteen years before my first novel, “Penal Fires,” was published. Sometimes it takes awhile to get that first story into the world before the floodgates open. With the breadth of your reading history, do you find yourself drawn to write any particular genre, or are you looking at diversifying there as well? I’ve written in several, starting out as a traditional mystery/thriller writer and graduating (some might say devolving) into a metaphysical writer. As long as it is the stories you want to tell, who cares whether the critics think you graduated or devolved, right? So, three books under your belt but that’s not all for your literary career. How did your journey play out? If you’ve read this far (Good for you–such endurance! ), you’ll notice a progression in content from literary fiction to what I call visionary thriller. My first story, “Special Training,” was based on a tragic experience witnessed during the Vietnam War. My teleplay, “A Question of Benefit,” was based on a person I encountered during this same period. Both of them are what I’d say were in the mainstream literary tradition. But as with graduate school, I chafed at the restrictions and conventions placed upon the writers of this genre. My life experiences showed me there were many more interesting people and topics to write about than sensitive loners learning to expiate the slights (real and imagined) against them through writing. That’s when I discovered Raymond Chandler. Though in retrospect I realize his writing is as stylized and conventional as much of the stuffy stuff I was reading in graduate school, his attitude (or voice) and subject matter were a breath of fresh air to me. I could never write about the mean streets his characters explored, but I could adapt those situations to my own experiences and find my own, not-so-sardonic voice. My first novel, “Penal Fires” was the result. An outpouring of my experiences in Madison, Wisconsin both before and after the bombing of Bascom Hall, the book is a conventional mystery thriller. A few years later, my second novel, “Metadata Murders,” extended the tropes of the mystery thriller into the realm of the Dark Web where the hidden, almost fantastical powers of the Internet could make anything possible in real life–even murder. And finally, my latest novel, “Mission: Soul Rescue,” takes the almost mystical possibilities of the Internet one step farther by exploring the potentials and complexities of accessing and releasing the power of the unconscious mind, not to mention the danger from the psychic vampires who feed off such energy. Fascinating journey William. I’m sure you have more ‘devolving’ to do as you continue your writing path. When you put down the keyboard, or pen, what do you like to do? What keeps you busy outside of writing? I’ve been retired for several years from my roles as a cataloger and bibliographer for the University of Minnesota Libraries, as an instructor of English and business writing for Rasmussen and National American Universities, and as a contributor and reviewer for the online news site, examiner.com. Currently, on those days not devoted to writing, I play golf and serve as president of the senior league at Highland Nine golf course in St. Paul, Minnesota. My wife and I also visit our sons and daughters-in-law on the East Coast and recently welcomed our first grandchild, a boy, into the world in March of this year, all of which has made our Norwegian Forest cat, mightily perplexed and annoyed by our occasional abdications of fealty to her needs and desires. Cats can be fairly territorial when it comes to the loyalty of their subjects. Congratulations on the grandchild. I’m certain he will keep you busy. I know you have an interesting tale to tell with regards to your latest work, so let’s hear it. This is one of those situations like being in an elevator with an agent and you have 90 seconds to “wow” him/her with the essence of your story. When I attended ThrillerFest the first time, I managed to be successful in convincing eight agents to look at my manuscript. But each of them returned it, saying something noncommittal like it didn’t meet their current needs. But one advised me to join a writing group and get other people’s reactions to what I’d written. Their comments and those of the editor my future publisher recommended helped me realize the limitations of the manuscript I originally submitted. That is great, William. Sometimes a rejection can open a different door and I’m glad it worked out for you. If anyone would like to get their hands on more information about William Fietzer and his works, or keep up with any future releases, you can find him at the links below. If any of you are thinking, “Hey, I would like to be on Meet the Author Monday” then you can check out the details HERE. Lyons has woven a magnificent tale of oppression and redemption, loss and love, despair and hope. As his unswerving loyalty to the Elder’s commands begins to crumble, he takes a fateful trip down the forbidden right fork of the forest trail he walks to the prison each day. This decision would set him down a path he never dreamed of before when his path crossed that of Vorena, a rebel trying to escape the isle of Tanas for a better life on Agoran. This chance meeting will change the course of both of their lives. Lyons weaves a seamless world that one finds easy to feel could truly exist, from realistic climate to a religious system as believable as any existing in our own world. She made me think, laugh, and cry with this book and I highly recommend you pick this book up immediately. My previous interview with this amazing author can be found HERE.